Superintendent John Whitbeck, head of the Eastern division, conceived the idea of standardizing DH-4s and assigning one to each pilot. Except in emergencies no other aviator was to fly the customized planes. Windshields, which protected pilots from rain and snow so it hardly touched them, were tailored to suit each pilot; seat heights were aligned to individual dimensions and sometimes minor changes in the placement of instruments were made to accommodate the pilots. Later air was piped from the motor into the cockpit to warm pilots' feet, but that modification would not take place for three more years. "The plane assigned to me was my pride and joy," said Allie. "It was the second plane to be fully rebuilt in the Cleveland shop and certainly a thing of beauty. Never had an airplane been put together that could compare with it. It had an all-plywood mahogany fuselage. The wings were covered with unbleached Irish linen that had been treated with clear dope; the fittings were painted with red enamel. The cockpit entrance was padded. There were hand-grips – one to the rear of the cockpit and the other ahead of the windshield. There was a steel stirrup attached to the lower longeron and also a metal step about the middle of the fuselage to facilitate entering and leaving the cockpit. They even provided me with an aft compartment where I could store luggage and other personal articles. Boy what luxury! I had never seen a plane so equipped." When Howard F. Salisbury, an airmail instrument technician at Cleveland, drew Allie's attention to a reinforcing ring around the inside of the cockpit between the two top longerons, he said, "In case you crack up there is less chance of a longergon splintering and going through your ribs." As a finishing touch, technicians inscribed the pilot's name on the fuselage at the cockpit opening. "When I first saw my plane I was so elated I could not speak," said Allie. Allie cared for his plane like an indulgent parent. By November 1921, Allie's DH had racked up 600 hours in the air, making it the second oldest plane in existence with that many miles to its credit. 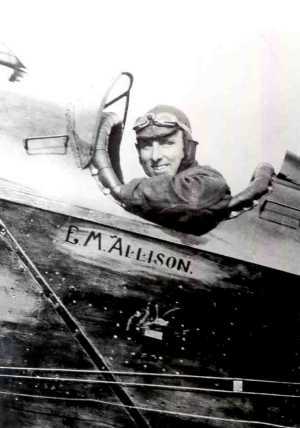 The plane cited for having the most miles, which was the first DH4 rebuilt in Cleveland, belonged to Elmer Leonhardt. Because the two DHs boasted an endurance record, Post Office officials decided to show them off at the second annual Pulitzer trophy speed race, held that year in Omaha, Nebraska. The planes were living proof that aircraft properly constructed and maintained could reach the ripe old age of 600 air hours. To his dismay, Allie was informed that another pilot would fly his plane to Omaha; officials insisted that he stay put so he could fly the Cleveland--New York run. "When I said goodbye to my plane I had a feeling I would never see it again," recalled Allie. "The pilot assigned to it left Cleveland, got in and out of Chicago okay but forced landed some place in Iowa, ran through two or three fences and some ditches. That was the end of my good plane. I never saw it again."